Simon & Schuster Books for Young Readers, 9781442446953, 320pp. 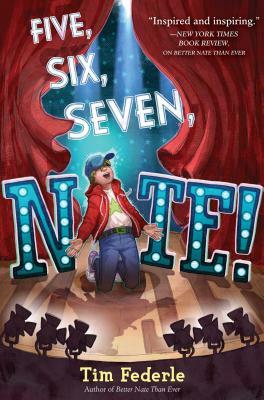 "With wit and panache, Five, Six, Seven, Nate! shows us that though we may face huge obstacles, we can and should still dare to dream big. These books, like their protagonist, have a heart as big, bright, and bold as Broadway." * "Nate will sing and dance his way right into readers’ hearts. This is an encore performance that will leave them standing in the aisles." *"[A] funny, tender coming-of-age story, which doubles as an insider account about growing up on stage that will appeal to every budding theater geek. Encore!" "[Five, Six, Seven, Nate!] provides a plot-driven, exaggerated exposé behind the scenes of a Broadway show that’s sure to entertain, and it continues to use Nate’s naïveté and the zany characters of the theatre for laugh-out-loud levity...Nate’s encore—an extravagant companion toTelgemeier’s Drama—will certainly be applauded by his loyal fan base." "Everyone could use a little more glitter in their lives, and Nate shares his with those who are willing to celebrate that being an understudy can one day earn you top billing."